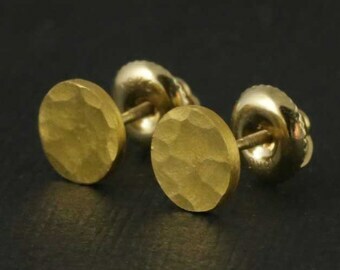 Looked everywhere for solid gold earrings for my daughter’s 32nd birthday. Most looked cheap or were too “trendy”. Then I saw these. Not only were they solid 18k gold and a classic design, but Rebecca and Charles shipped them super fast to my daughter in Florida (I live in Wa. State). They arrived 2 days early and were beautifully wrapped. My daughter absolutely adores them and says she will never take them off! Also, the earrings have screw backs so she doesn’t have to worry about her two year old and one year old daughter’s ripping them off and eating them! One of the best purchases I’ve ever made anywhere. Thanks guys! Just finished a gorgeous 22k full round band; had to snap one last photo of it before it went to its new owner! 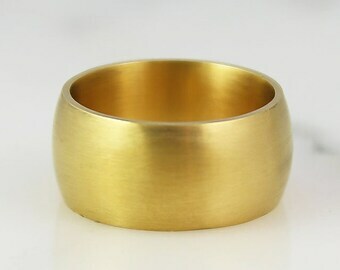 Finishing touches on a soon-to-be-released 14k gold engraveable stacking band. 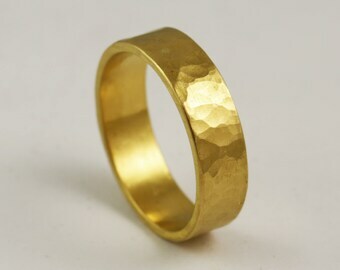 Love this one for a special name, antique inspired poesie ring, or wedding band. We're husband-and-wife team Charles & Rebecca. We're dyed-in-the-wool perfectionists, and we’re obsessive about beautiful things. We began our jewelry journey as collectors and curators of antiques, where the unique beauty of old pieces helped us to see jewelry not just as an accessory, but as an heirloom and a sculpture. From this deep appreciation for jewelry grew our desire to make our own pieces, where we could weave some of our favorite elements of the past into modern, wearable jewels with personal meaning for our clients. We believe the good things in this world are made by people who love them—as artists who love our craft, we will always take the extra time to make sure each piece receives the time and care it needs at each step -- from initial design to stone-setting to packaging it to go out – to make sure it is ready to delight you for years to come. No detail is so small as to be unimportant to us, and we know it’s the little things that make a piece special. 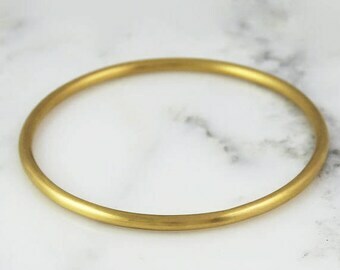 We make our jewelry right here in the lovely Midwest, using recycled gold. We strive to be passionate, genuine, and approachable in everything we do. If you ever have any questions, please reach out to us! Rebecca is an art historian and GIA-certified diamond grader. Charles is also a carpenter and all-around craftsman, and he brings his microscopic attention to detail and love of finely made things to his jewelry work. We work together designing and goldsmithing, when we’re not busy chasing our toddler or restoring our Victorian home. A GIA-certified diamond grader with a degree in art history, Rebecca was drawn to jewelry as the junction of natural beauty and art. Charles is also a carpenter and all-around craftsman who specializes in the restoration of antique homes. He brings his microscopic attention to detail, love of finely made things, and years of hand-construction experience to his jewelry work. Levi & Jasper divide their time between soaking up the studio's sun and vigilantly waiting for the postman. Hoard Jewelry is a thoughtful blend of handmade fine jewelry and carefully curated antique finds. While our collection ranges from Georgian to custom-made right for you, we strive to carry only pieces of exceptional beauty. All antique or vintage items can be returned (in original, saleable condition) for a refund less actual shipping fees, a 3.5% fee to cover our seller's fees, and customs charges where applicable. Customs charges do not go to us, but are handled by your country's customs offices. Items must be post-marked for return within 4 days of receipt / first attempted delivery by carrier. Items purchased on layaway plans cannot be returned. Damaged or altered items cannot be returned. Custom items, items made to order, and items altered or sized for you cannot be returned. All handmade items are made to order and are non returnable. Payment, whether full or partial, is due at time of purchase. We require at least 20% down at time of purchase. Installments are non-refundable. Items purchased on layaway plans cannot be returned. Payment must be completed within 6 months of purchase date. We accept layaway payments via check, PayPal, PayPal Credit, and credit card. PayPal Payments: If you would like to pay via PayPal, we will send you one invoice; this invoice will allow for payments in installments over a 6 month period. You can make payments at any time simply by logging in to your PayPal account and accessing your invoice, so it won't be necessary for you to wait for us to invoice you. PayPal Credit: This is a wonderful service we strongly encourage you to look into. You sign up directly with PayPal. We receive our funds right away, so we ship right away – then you pay your balance off directly to PayPal. If your balance is paid off within 6 months, PayPal charges no fees or interest. The advantage to this service is that your items ship immediately. Credit Card Payments: If you prefer to pay via credit card, we will create custom listings for you each month so that you may check out with each installment separately. HOLDS: We cannot hold items without payment. Please see our layaway terms if you wish to pay for an item over a period of time or to receive it at a later date. CUSTOMS & DUTIES: All customs fees, taxes/tariffs, and any associated landing or import fees are the responsibility of the purchaser. We reserve the right to cancel and refund any order before materials have been ordered for it, should the cost of raw materials have risen substantially. We also reserve the right to cancel and refund any order on which a coupon has been used that lowers the item cost too close to the cost of materials. All orders will be shipped fully insured with tracking and delivery confirmation via USPS or UPS. Most of our quoted shipment rates are for USPS; if you require shipment via UPS or FedEx please contact us for an updated shipping quote. If you would like signature confirmation on a package, please let us know. Estate items ship within 1 day of receiving an order, unless alterations to the item are requested. Handmade items generally require approximately 2-3 weeks lead time. Domestic orders take between 2 and 10 days in transit--generally much closer to 2. Overnight shipping is available; please message us for a quote. International orders of $400 or less will ship via USPS; these orders generally take between 7 and 16 days to arrive from time of shipping. This can be significantly slower during times of holiday workload, and will depend on the speed of both the United States' and your own country's customs clearing house. We do offer 2, 3, and 4-day expedited international shipping via UPS; please message us for a quote. All orders of over $400 will ship via UPS and generally take between 2 and 8 days to arrive. All items will be declared properly on customs forms; Hoard Jewelry cannot label anything as a gift. By properly declaring all items, we are able to insure all items for their full value; this ensures your new purchase is safe. All duties, landing fees, and taxes are the responsibility of the purchaser. If you require expedited shipment, please contact us for options and rates. We do not edit or alter your messages, so please be sure to punctuate and space your engraving request exactly as you'd like it to appear. If no font is specified we will choose Fette Din 4 line for diamond tip engraving, or Bookman Old Style for laser engraving. Hoard Jewelry dates each piece based on materials, construction techniques, hallmarks/signatures, overall style and cultural context. While dating and authenticity are not a formal science, we determine them to the best of our ability based on our knowledge, experience and resources. Some of our pieces are mounted in a way that makes it difficult to determine a precise stone’s grading. Diamonds and colored gemstones that cannot be removed from their vintage settings without harm to the piece are evaluated in their mountings using industry-standard measurements and formulas. Unless graded by a third-party appraiser, stone gradings are done by Rebecca Cooner, a GIA-certified diamond grader. Jewelry descriptions and all carat weights stated represent approximates. Mounted stone(s) is/are graded only insofar as mounting permits observation. Most colored gemstones (i.e. rubies, sapphires and emeralds) are often treated to enhance their beauty; some treatments may not be permanent and/or may require special care. Please email us for further details. We cannot guarantee that the color you see matches the item color, as the display of color depends, in part, upon the type of computer monitor used to observe the image. Pieces could go out of stock before we’re able to remove them from the site. Should this occur, we will notify you. We make every attempt to only show our users correct information. From time to time inaccurate data may be displayed due to system error. We reserve the right to correct any incorrect pricing as a result of the above, and will not honor any incorrect prices. Under no circumstances will Hoard Jewelry be held liable for any indirect, special, incidental or consequential damages of any kind, regardless of the form of action, whether in contract, including negligence, strict product liability or otherwise, even if we have been advised of the possibility of such damages. Forum selection: If either party brings against the other party any proceeding arising out of this transaction, that party may bring that proceeding only in Rock County, Wisconsin, only if there is no federal subject matter jurisdiction, in any state court of Wisconsin, and each party hereby submits to the exclusive jurisdiction of those courts for purposes of any such proceeding. We value your privacy. All transactions are strictly confidential. The only information we will share is your delivery address with relevant shipping companies. We will never sell or share your details to any third party. By purchasing from Hoard Jewelry, LLC, you agree to these terms.